From the weekly food shop to those all-important kids’ parties, managing your child’s food allergy can be stressful for both you and your child. You worry about their safety, but you don’t want them to miss out and they don’t want to feel excluded. Here, Consultant Paediatric Allergist Dr Adam Fox provides top tips for managing your child’s food allergy when out and about. 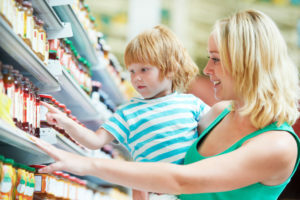 How do I manage my child’s allergy when food shopping? Food businesses who supply prepacked foods are required to emphasise any of the 14 specific allergens in the ingredients list of prepacked food. These must be emphasised on the label if they are used as ingredients in a pre-packaged food. Businesses can choose what method they want to use to emphasise these allergens, for example, by listing them in bold, italics, highlighted or underlined, to help identify them. Regulations also state that information about allergenic ingredients is to be located in a single place, i.e. the ingredients list on prepacked food. This means that the voluntary use of the previous types of allergy boxes (such as: ‘Contains nuts’) that provide a short cut to allergen ingredients information also given in the ingredients list, is no longer allowed. The use of voluntary precautionary allergen labelling such as ‘may contain’, to indicate the risk of unintentional presence of allergens in a food, is still permitted and has not been affected by this regulation. Previously, loose foods (that can be bought without packaging) for example in supermarkets, delis, cafes and restaurants; didn’t have to provide information you need about food allergens. However, since 13 December 2014, information on any of the 14 allergens used as ingredients should be provided for these foods. Should I be concerned about cross-contamination? Sometimes traces of allergens can get into products unintentionally during the manufacturing process or during transport or storage. These different phrases describe how the risk arises, but are not indicative of the severity of the risk. For this reason, none of these warnings should be read as being more or less serious than another phrase. How do I manage my child’s allergy when eating out? For food businesses which provide non-prepacked food, such as retailers, restaurants, takeaways, bakeries and institutional caterers (e.g. nurseries, schools, workplace canteens etc. ), there is a requirement to provide information on allergenic ingredients. However, where possible, try to plan ahead before eating out. Most restaurants now have online menus with clear allergen labeling so you can check in advance. Always let restaurant or hotel staff know about the food allergy in advance or upon arrival. Make it clear that it’s necessary to avoid any dishes that may contain that food. Ask them if they can provide a separate dish, free from the allergic food. Explain the risks and if you are uncertain don’t be afraid to ask. Be particularly careful at salad bars and buffets where food can be easily cross contaminated. 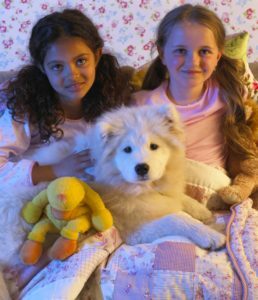 How do I manage my child’s allergy when they go to kid’s parties ? If your child has an allergy and is going to a friend’s birthday party or celebration, it’s always worth packing some party food in case the food being served isn’t suitable. For example, if they have an egg allergy, have a batch of cupcakes in the freezer and simply defrost one or two for them to take along. Cakes generally keep well for up to a month and they work best if you use silicone cupcake cases rather than paper cases when freezing. Whilst you don’t want your child to feel singled out at a party, their safety is the most important thing. You could also ask the parent in advance what type of birthday cake or party spread they are preparing, so you can pack a few similar items. Even if you’ve advised the parent or organisation hosting the party about your child’s food allergy, you should provide them with your contact number. If you’re particularly concerned, hang out at the venue or somewhere close by. So in the unlikely case they do come into contact with a food they shouldn’t, you can be on hand with their treatment plan. It can be overwhelming for parents whose children don’t have allergies to think about dealing with an allergic reaction or administering an epipen. Bringing our own food as well as taking sensible precautions such as always carrying medication means that your child won’t miss out on those all important social occasions – after all, their party schedule is often more busy than mum and dads! For more advice, click on finding support.